People have been eating psychedelic mushrooms since ancient times. There are even indications--although they are impossible to verify--that psychedelic mushrooms played an important role in cultures like the Mayan civilizations of South America thousands of years ago. Of course, the use of "magic" mushrooms has continued into the present day, but it wasn't until 1958 that Albert Hofmann (the discoverer of LSD) isolated psilocybin as the active hallucinogenic compound in psychedelic mushrooms. Recently, psilocybin has also received some recognition as a potential treatment for anxiety. For example, a pilot study conducted in 2011 explored the ability of psilocybin to reduce anxiety in individuals with advanced stage cancer. Although it was a small study and only exploratory in nature, it suggested that psilocybin could have some benefit in reducing anxiety and improving mood in patients with a terminal illness. In a study due to be published soon in Biological Psychiatry, a research group in Switzerland explored a potential mechanism for reduced anxiety after psilocybin administration. 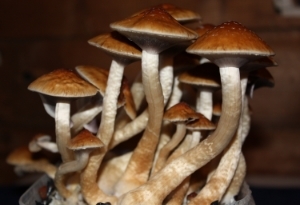 The authors, Kraehenmann et al., administered psilocybin or placebo to a group of participants. Then, they monitored the participants' brain activity using functional magnetic resonance imaging (fMRI) while the subjects completed a task that generally increases activation in an area of the brain called the amygdala. The task involved viewing a series of pictures; half of the pictures presented negative stimuli like a car accident, and the other half presented neutral pictures like everyday objects or scenes from daily life. The amygdala is an almond-shaped collection of nuclei in the temporal lobe (there are actually two amygdalae--one in each hemisphere). Increased activity in the amygdala has been associated with emotional reactions, and especially with fear and anxiety. Hyperactivity in the amygdala has also been observed in depressed patients, and treatment with selective serotonin reuptake inhibitors (SSRIs) has been found to reduce that hyperactivity. This suggests that increased activity in the amygdala may also play a role in symptoms of depression. Kraehenmann et al. found that psilocybin administration improved mood and decreased anxiety, which was to be expected (magic mushrooms acquired their moniker for a reason). The study, however, also offered some insight into what might be causing that reduction in anxiety. After taking psilocybin (as compared to placebo), activity in the right amygdala was reduced while viewing negative images, and activity in the left amygdala was decreased in response to both negative and neutral images. Psilocybin is thought to act as an agonist at serotonin receptors, meaning it increases serotonin transmission. Thus, it may be that antidepressants like SSRIs that act on serotonin--at least as part of their mechanism--have something in common with psilocybin. And, it suggests that perhaps psilocybin should continue to be investigated for its antidepressant and anxiolytic (anti-anxiety) properties.